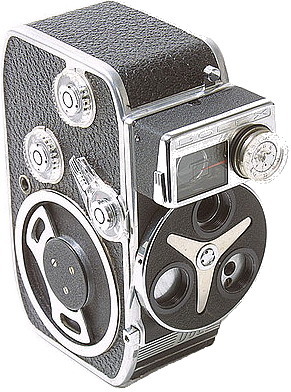 Produced in 1952, but commercialized in 1953, the "B8" is similar to the "L8", but is equipped with a turret with two lens; they are interchangeablei. The viewfinder can be switched to accomodate the set focal lenght (12,5 mm, 25 mm et 36 mm). It has seven frames per second: 12, 16, 18, 24, 32, 48 et 64. Its weight is 0,950 kg, and has the following size: 49 x 128 x 125. .......... 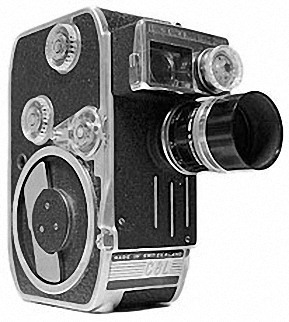 This movie camera, equipped with reflex viewfinder, is undistinguishablethe from the "H16". 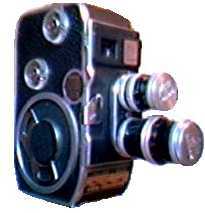 It can receive a double-8 film, and so it gives out 60 meters film (id est 16 minutes). 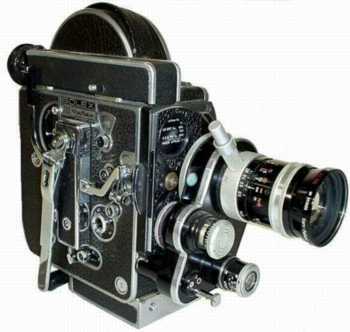 This movie camera is very famous for its exceptional mechanism. Paillard H 8 Suprême 1954. Like the H 16 Suprême but 8 mm. Kern Paillard Vario-Switar 1:1.9 8÷36mm. Its weight is kg. 2,700, and it has the following size: 68x213x200. Produced in 1959, is equipped with a lens Shneider Variogon 1:1,8 8-48 mm. Its weight is kg. 0,850, and it has the following size: 49x128x120mm. It has seven frames per second: 12, 16, 18, 24, 32, 48 et 64. Highly polished duraluminium body, covered in genuine Morocco leather. Metal parts are chrome-plated. Produced in 1958, is equipped with a lens Shneider 1:2,8 10-30mm. Its weight is kg. 0,850, and it has the following size: 49x128x120mm. It is compact and light. Highly polished duraluminium body, covered in genuine Morocco leather. Metal parts are chrome-plated. Produced in 1959. It is equipped with three lenses: Kern Yvar 1:1,8 13mm; Kevin Pizar 1:1,9 5,5mm; Kevin Yvar 1:2,8 36mm. Its weight is kg. 1,050, and it has the following size: 49x127x129mm. Highly polished duraluminium body, covered in genuine Morocco leather. Metal parts are chrome-plated. The viewfinder is an optical type; adjustable dial shows the scene as viewed by focal lengths of 12.5mm, 25mm and 36mm. Accessory prism attachments allow for filming with 5.5mm lenses, and for parallax correction while filming at close distances.